Welcome to my blog!! I am new to this, so (please) bear with me as I learn while I go. My first post will be my Summer Heat 2009 mixtape link. 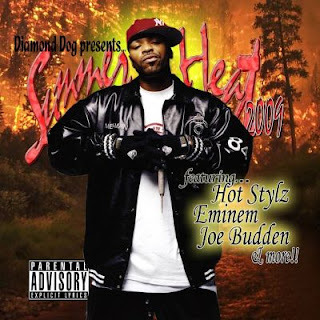 Summer Heat 2009 consists of new hip hop as well as throwbacks. It also contains blendz and mixes exclusive to this cd. You can access the mix directly by clicking HERE. You can also download it via my MIXXES page or simply listen to it there (on the flash player). The whole cd is not your typical mixtape. It is a long-playing mix that is meant to be played at a party or even a club. The drops are tastefully added, but not overplayed. I just uploaded this to my own server 2 days ago, so it is still brand new. In fact, I haven't even finished duplicating the master cd, yet. This mix is guaranteed to stay in your home stereo or car throughout the summer and even into the fall. If you enjoy hip hop, you will enjoy the creative blending of the music on this cd. You can also download the mixtape in a ZIP file here or by clicking on the album art. The ZIP file contains an mp3 of each individual track as well as the cd art and contact information. The ZIP file is 117MB and encoded at 192kb/sec. The benefit of downloading this is the ability to burn the mixtape to cd (using burning software such as Nero) with much ease once it is downloaded and extracted. I will be updating this blog regularly as I learn more. Be on the lookout for some older mixtape posts as well as a few up-and-coming mixtapes due out later this year.